I always liked Forrest Gump, but “peas and carrots” brings to mind the awful institutional variety – little cubes of lifeless, washed-out orange and green that taste like tin can. Blech. The homegrown variation (thankfully) doesn't even taste like the same food. Now, I still don't care to mix the two, but the garden is currently providing both in abundance and we are enjoying them separately. 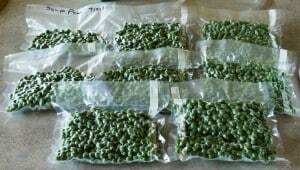 This spring I planted three double rows of shell peas (Green Arrow – another favorite is Miragreen, but Fedco sold out of those seeds this season before I got my order in), two earlier (about 15 ft each), one later (about 10 ft), to extend the harvest, on one double row (10 ft) of Sugarsnap peas. We typically run out of shell peas mid-winter and I have to resort to store peas, which no one cares for, so I am hoping that this will provide us enough to get through to next season. In spite of the lack of rainfall, the peas have been producing well (I have been watering). They do enjoy the cooler temps we've had this summer. I've got around 15 pints in the freezer so far, and hope to double that (or more) by the end of the season. (Don't tell the boys – they are tired of picking and shelling peas already.) It's important that you process them within hours of picking, as they quickly start to convert sugars to starches, giving you the bland, mealy taste so common to store bought peas. 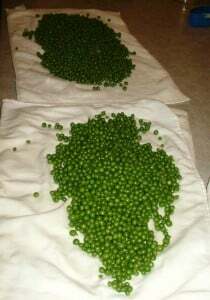 The latest round of picking yielded around 5 gallons of peas in the pod. We shell them, blanch them for three minutes, rinse them in cold water so they don't over cook and spread them on kitchen towels to dry. This sounds a little odd, I know, but I think it gives a better quality product in the end. After drying for a while, I spread them out on cookie sheets that are lined with super parchment and put them in the freezer. I pre-freeze them like this for a couple of reasons. 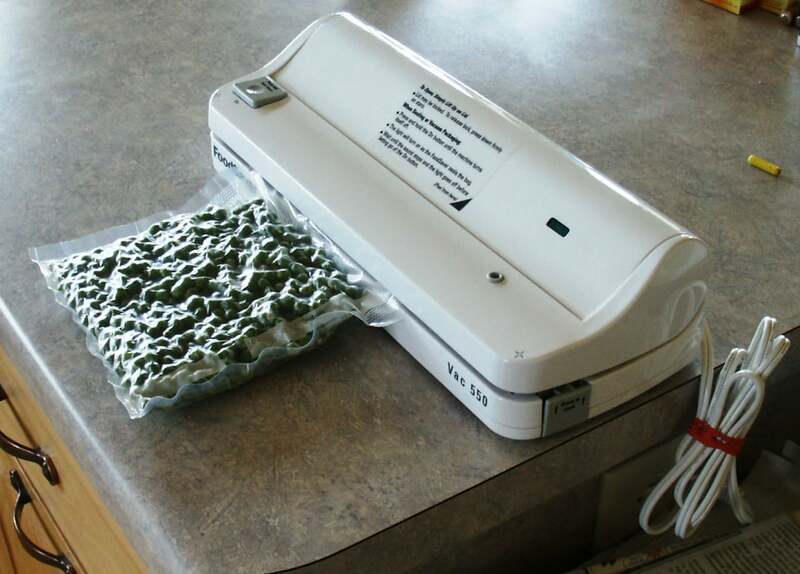 One) it keeps them from forming a big green lump in the freezer, and two) I re-freeze them in vacuum seal bags, and if I don't pre-freeze them, moisture often gets in the seal and it doesn't hold (the vacuum breaks). 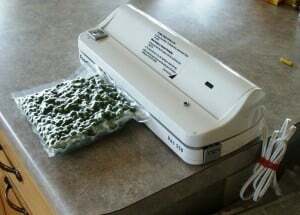 The vacuum sealer really helps to prevent freezer burn, improves produce quality and significantly extends the freezer life of veggies, so I find it worth the extra effort. 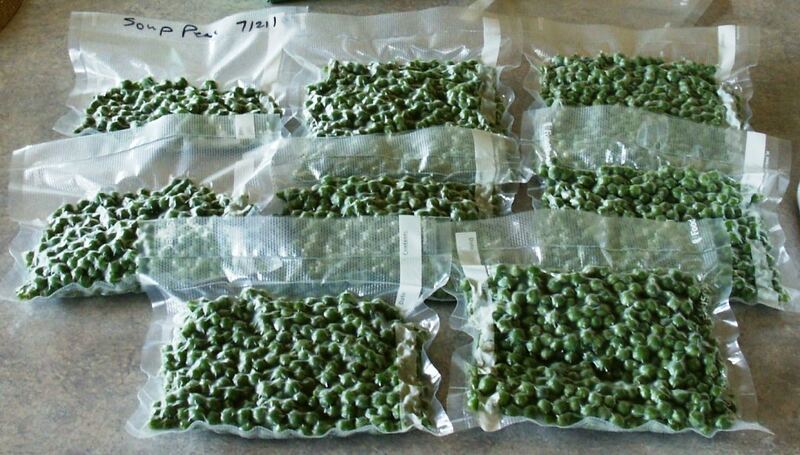 After sitting in the freezer overnight, I pack up the peas in an assortment of bag sizes (I buy the vacuum bags on a roll so I can cut them to size). That way I can take out as much or as little as I need depending on the number of people I'm feeding. This time around I ended up with eight more packages of green goodness. 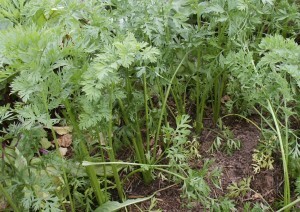 On to the carrots…I did the first thinning of carrots several weeks ago, so they are now due for second thinning. 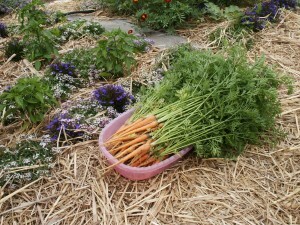 This time around thinning also involved harvesting, as some of the roots are several inches long. 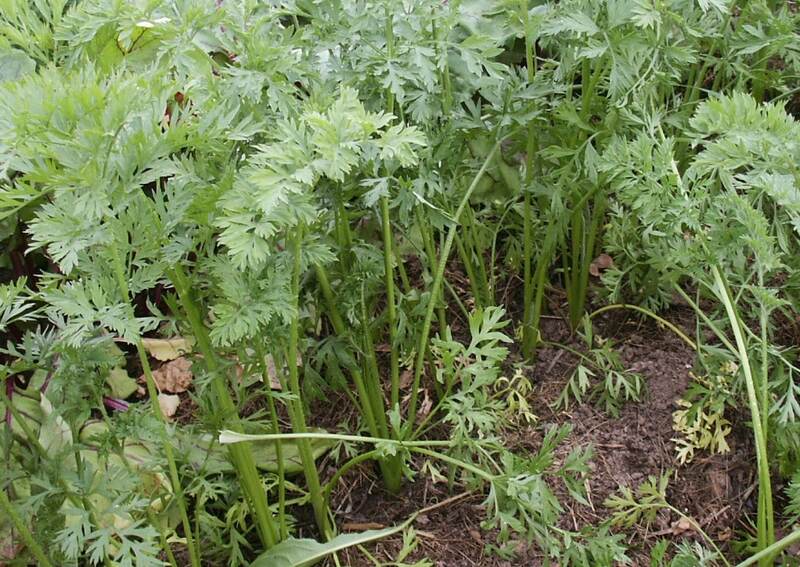 I'm leaving an inch or two between plants at this point, and will continue to widen the spacing between plants as the season continues, harvesting every other carrot as needed. They look so petite and pretty! I twisted the tops off, gave them a good scrub and they were ready to hit the stove. I put a little water in the bottom of the pot and basically steamed them for a few minutes until they were tender. I put them on the table with some butter, salt and pepper nearby, but we all just ended up munching them “as is”. The first peas and carrots are so sweet, delicate and flavorful that it's hard to believe they're the same food as their industrial counterparts. It's a lot of work to preserve as much as we do (I don't know how my mom and grandmas did as much as they did back in the day, between using wood stoves and having bigger families). I sometimes get tired of explaining to friends that, yes, I am once again working in the garden or preserving, but I feel driven to feed my family this way. It's one of the few things I have control over in our environment, and I want our food to be as health giving as possible. Oh I wish I could taste those! We're doubling the size of our garden at the end of this year so we'll have more to eat from; the store just pales in comparison to fresh vegetables. Laurie, I've been reading your blog for more than half an hour. Now who is going to do my dishes? Have you ever tried blanching the peas IN the pod? You can freeze the pods and strip them out at the table or strip them out after they are cooled after blanching. They just pop out of the blanched pods. I like this method because you can get a lot blanched, and not have to chase those little buggers around in your pot. 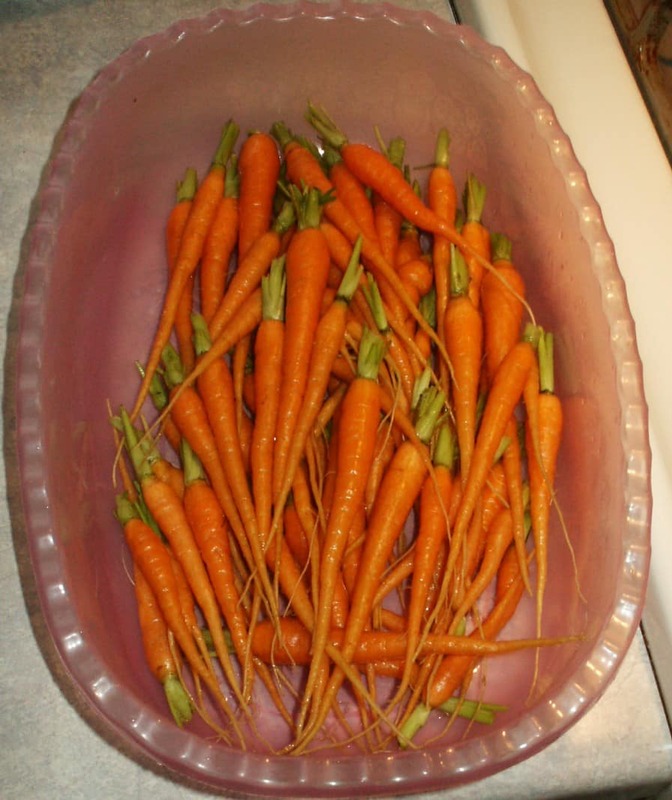 You can also get them all blanched and throw them into the refrigerator until later. The whole process still takes a lot of time, but you can spread it out better and get the peas processed in a quick time after harvesting, therefore preserving as much of the tasty sugar in the peas. d – I firmly believe in child labor. The peas come in, we all sit down and shell, I blanch, I rinse, I spread out to dry, I freeze. We may have a couple of strays when we are shelling, but that's about it. 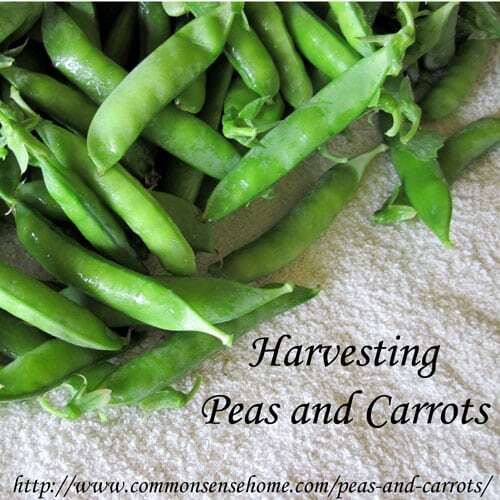 When I am blanching and the peas are ready to come out of the water, I put a strainer over a clean basin and simply dump the whole pot contents – water and peas – into the strainer. After they've drained, I dumb the hot water back into the pot for the next batch. No chasing required. 🙂 It's still labor intensive compared to grabbing a bag at the store, but even the fancy organic peas I've tried a couple of times don't even come close on flavor.